Manufacturers, importers, and re-sellers will sometimes send me product sample and ask me to test the product and then review the product. My review process for testing motorcycle jackets normally takes four to six weeks. I will wear a jacket on long rides and short rides (about 10 hours of riding). I am looking for ventilation, comfort, and quality while riding. I will also inspect the construction, materials and abrasion resistance as well as look at things like zippers, pockets, vents and all the things that matter from a practicality standpoint. 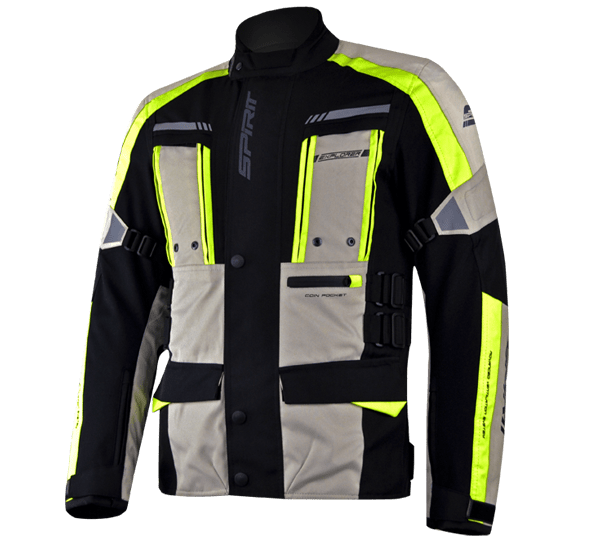 This jacket is designed and produced by South African company Spirit Motorcycle Accessories based in Cape Town. I have to say that I was pleasantly surprised. The quality was very good. this is known as a “4 Season tourer” jacket with an all-weather solution, these transition jackets are developed to get you through natures worst. The jacket had 2 removable inner liners and more ventilation than you would know what to do with. A zipper at each wrist, two large outer ventilation panels at the chest area and a very large ventilation panel that opens on your back. It easily transformed from a durable winter riding jacket into an air vented summer jacket. When I “accidentally” made contact with the asphalt, it resulted in very little damage to the outer shell and no damage to myself. When tested in the rain it kept me dry even at high freeway speeds. The fit was snug and comfortable, the Velcro on the wrist area was much more durable than some other jackets that I have tested and worn. The zippers are of very good quality and once again better than some others I have worn. The main front pockets are sealed and closed with Velcro and are large enough for a cell phone and a few other items. The back shoulder and elbow armor are CE rated and they are comfortable and not restricting while riding seated or standing. This jacket comes with matching EXPLORER pants which I will review at another time. NOTE: I liked them so much that they are now my daily wear when riding, that is until something better that are just as good value for money comes along.